In this article you will learn, how to rotate screen of computer and how to rotate screen on laptop. 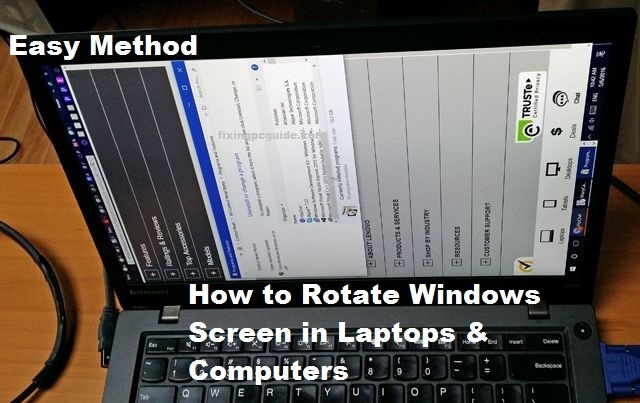 This is the easiest method of rotating screen or display of pc. This method is worked in these computers , in which the graphic or VGA driver is installed.If you want to rotate screen on laptop and how to rotate screen of computer, then follow these steps carefully. Step 1. Enable display Rotation in the Graphic Settings. Display the Desktop Screen, and right click every where in the desktop, then choose "graphic properties" in the menu bar. Click on "Display Settings" at the left-hand side of the window panel, then enable the display rotation by clicking on "enable rotation" at the right-hand side of the window panel. Then click on "Apply" and the click on "OK". A new window pop-up, and in this window click on "OK" to confirm the save changes. Step 2. Enable Hot Keys to rotate the Laptop and Computer Directly through pressing Keys. Click on "Hot Keys" at the left-hand side of the window panel, and then enable the hot keys by clicking on the " Enable Hot Keys". Step 3. Rotate Display of Computer and Laptop By Hot Keys Directly. If you want to rotate the display to right-hand side, then hold down the "Ctrl + Alt + Right side arrow" Keys. If you want to rotate the display to left-hand side, then hold down the " Ctrl + Alt + Left side arrow" Keys. If you want to rotate the display to Normal or Up-side, then hold down the " Ctrl + Alt + Up side arrow" Keys. If you want to rotate the display to Down side, then hold down the " Ctrl + Alt + Down side arrow" Keys. After reading this article, I hope you learned that how to rotate screen of computer or how to rotate screen on laptop.